as a side issue the bed temperature overtime is set too 125 can this be set higher ? ; Machine configuration, note these are thr motors drives and not the Axis! ;Note that these are the motor currents for the axis labelled X,Y,Z,E0 on the Duet board! M208 X0 Y0 Z-0.5 S1				; set axis minima in mm (adjust to make X=0 and Y=0 the edges of the bed) (Z can go slightly negative for testing and calibration, set back to 0 one fully calibrated). Would upload picture but not sure how… ext host ? Congratulations on building a working printer from scratch. Without knowing what your prints look like and what it is that you want to improve, it's hard to know how we can help you. The heater temperature limits can be changed using the M143 command. See the supported gcodes page on the wiki for the detail. The bed heater is normally heater 0. Im using printbite at moment so will higher bed temp help ? At a glance, I'd say you have the hot end set at too high a temperature. But there are gaps between the infill and perimeters which could indicate under extrusion. It's not handling overhangs well at all - might need print cooling or a lower layer height will help (but so will lower extrusion temperature). It's not doing small sections well - could just be too hot. The first thing I'd do is some test pieces - simple cubes and so forth to fine tune the extruder steps per mm and find the best temperature for that particular filament. Then move on to one of the test pieces on thingiverse to set the retraction settings. Once you done that, then you can look at fine tuning your slicer settings for that particular model. possible retraction needs increasing, but not sure about this yet. Do you have an end gcode to move the nozzle away from the print (there's that thing on the top of the chimney). Underextrusion: either your E steps/mm is off, or your extruder isn't pushing fully, or your filament diameter/ extrusion multiplier is off. May also check that gap fill is turned on. Nozzle too hot or insufficent part cooling: the droop at the back hole and roof bottom. Chimney: definitely needs more part cooling. More evidence of droop at the roof bottom as well. Those lines on the outside of the hull: either z banding or over extrusion. Can see letters on bottom. Good. Again, underside of hull. More part cooling. Only 1 or a few "zit" visible here, retraction seems ok. So, what slicer, what settings are in it wrt what I mentioned above…? Nice machine, I see no part cooling fan and what seems to be a bowden extruder. What extruder are you using? Very easy for a cheap extruder to miss steps/ extrude unevenly. What nozzle size? If it's bigger than 0.4 (ie 0.6mm and up) we're in "fat lines" business and I change my approach significantly. If it's a volcano style nozzle (seems to be) then your plastic will stay hot much longer and the part cooling fan is even more important. Extruder is E3ds titan on a bowden set up with a good sized motor. How long is the Bowden tube and what length retraction are you using with it. I think you'll see the largest improvement by dropping the hot end temperature unless you are printing at very high speed. The volcano has a large melt chamber and you'll find that for "normal" speeds you can use a much lower temperature than you have been used to. My hot end also has a large melt chamber and I regularly print at 10 to 15 degrees below the manufacturers recommendations because it gives me far better results. But try and see - every printer is different. Of course I'm building a machine for each hotend type I have, so it's ok. And I have a big E3D box. Oh, I read your other comment about this. This was in response to that. I would love it, but I'd have to make a version with a 0.2mm nozzle for myself so that I could use 5 filament color scraps instead of 5 reels. If we count all my half-built/ torn apart frames, I now have 20 printers. 2 x Wanhao Duplicator i3 - heavily upgraded. First one just became my best printing machine, second one is getting a diy 4x y splitter like prusa multimaterial. 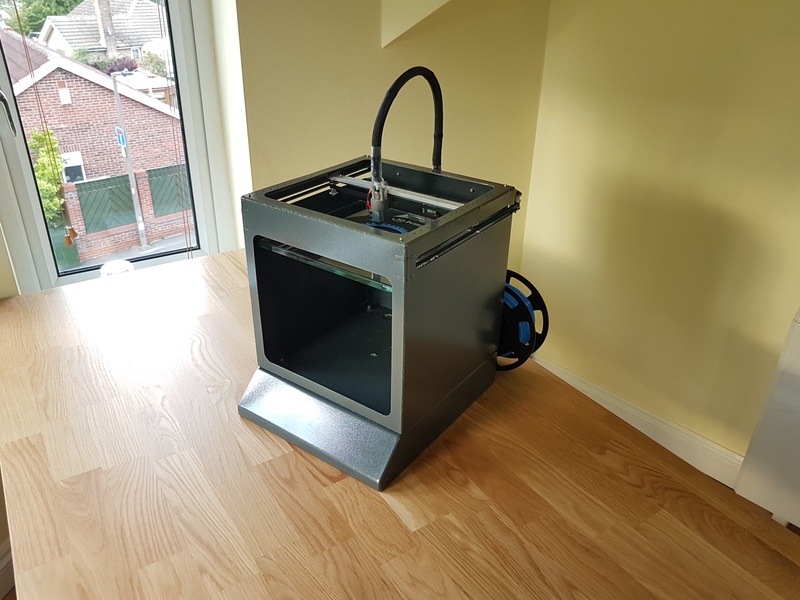 Duplicator i3 Plus. On the list for modifications. 3 custom designed sheet metal based on CNC machanics - this is the 300mm^3 frame. Also have 1 where this was a box frame from 20x40 extrusion instead of a folded sheet metal frame. Still have the 80/20 Frame from the gmax I tried to build as my first printer. 5 frankenbot. Our clone of the old laser cut wood Printrbot Plus, BOM around $125. I spend over $250 buying 18kg of PLA at a time from Microcenter. right guys part cooling fan and abs seams to fail regardless of what I'm trying ? maybe its to powerful… ? print bite temperature settings ? bed 115deg and hot end 220deg ? what do you guys think to retraction settings ? how is best for me to upload the simplify 3d ff file ? now things have gotten harder i tried updating the firmware with he web interface and it restarted as i had expected but can't connect to it both online and through usb ? What firmware versions were you upgrading from and to? Did you read the upgrade notes first? Did you read the upgrade notes?